HOT SPRINGS, Ark. 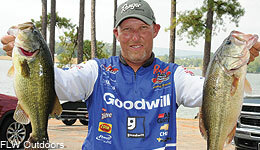 (Aug. 1, 2011) – The 2011 Forrest Wood Cup presented by Walmart will return to Hot Springs, Ark., and Lake Ouachita Aug. 11-14. Hosted by the Hot Springs Convention & Visitors Bureau, the world championship of bass fishing will feature 116 of the top bass anglers in the world casting for awards up to $600,000 in the Pro Division and up to $60,000 in the Co-angler Division. National Guard pro Mark Rose of Marion, Ark., who placed third in the 2011 Walmart FLW Tour Angler of the Year presented by Kellogg’s race, said he thinks there may be an early-morning topwater bite, but for the most part the tournament will be focused on deep water and deep-water baits such as 10-inch soft-plastic worms. “I think if a man got 12 pounds every day he’d be in really good shape,” Rose said. “I think we’ll see bigger weights, though. And it may not take that much to win. Curb Records recording artist Steve Holy will bring his unique blend of 50s rock/pop/country to Summit Arena on Sunday, Aug. 14, at 4 p.m. to kick off the Forrest Wood Cup’s final weigh-in. Described by the Dallas Morning News as “Elvis Presley meets Dwight Yoakam” and “Ricky Nelson meets Chris Isaak,” Holy recently completed his third studio album, “Love Don’t Run,” featuring the single of the same name that was named a Top 5 most added single in the first week of 2011 by Billboard and Country Aircheck. As part of FLW Outdoors’ commitment to community relations, FLW Tour anglers will be participating in a project with Teen Challenge of Arkansas on Wednesday, Aug. 10. Volunteer anglers will work with Teen Challenge to prepare a house for occupancy by a family who receives assistance from Potter’s Clay – a womens’ and childrens’ crisis center.